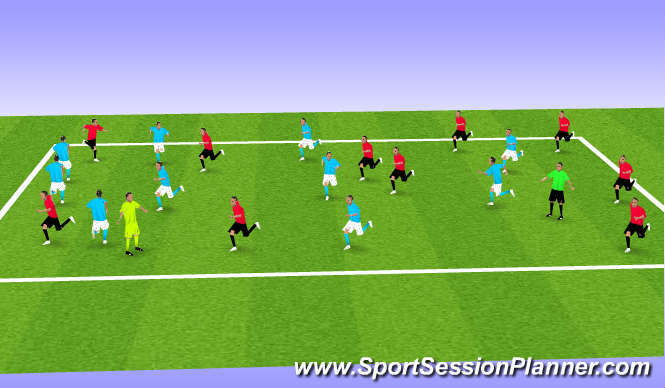 WARM_UP 10/15mins - organize players in a 8V8 within a area of 30X30yds and instruct players to gently jogg for a given time approx 5mins then increase tempo of excersise by faster tempo of running and start to involve some dynamic stretching and other practices i.e sideways running &apos;backwards running and various physical demands on players whilst still involving dynamic stretchhes and some static stretches &apos;warm-up to finish at match pace in order that players muscles and joints are ready for demands of upcoming physical demands ,warm-up to last approx 10mins . . . 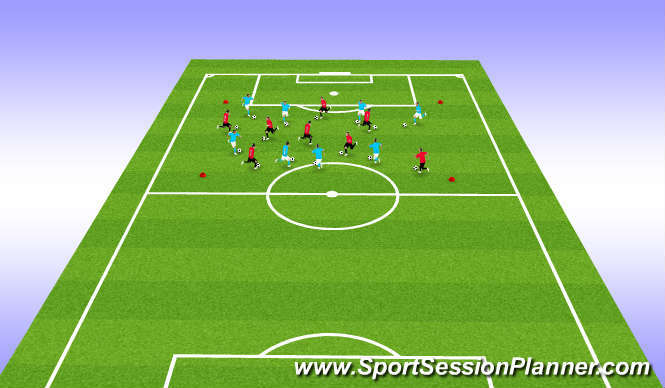 AWARENESS & DECISION MAKING 20mins - play full pitch if available and enough players &apos;but you can of course modify practice depending on area and no of plrs what we&apos;re looking for is players to see the positions and movement/passes to achive goals &apos;practice organisation is that there are five gates/goals available to players plus regular goals so plenty of opportunities to score which in turn increases whole tempo of game - ples score in confentional goals or they score by dribbling through either of the five goals situated on pitch (see diagram) in the direction they are attacking no goal for dribbling through cones in direction of goal they are defending this is to promote plrs to always look to go forward and of course when team is defending they must be alert in every position as result of threat all over pitch - object of practice is to demonstrate to plrs that they must exploit everry area of pitch when in possosion and the need to defend all areas when without possesion i.e thre five goals give added insentive for wide plrs to run/attack space in front of them also in centre-midfield, you should also in-corperate conditions such as winger must dribble through wide gates in order to deliver cross and so on . . . . COOL DOWN - Plrs to lightly jogg around area performing various practices such as high knees &apos;heel flicks and so on involve statyic stretches and instruct plrs to drink warter throughout cool down so as to aid reh-ydration and recovering&apos;cool down to last approx 5mins . 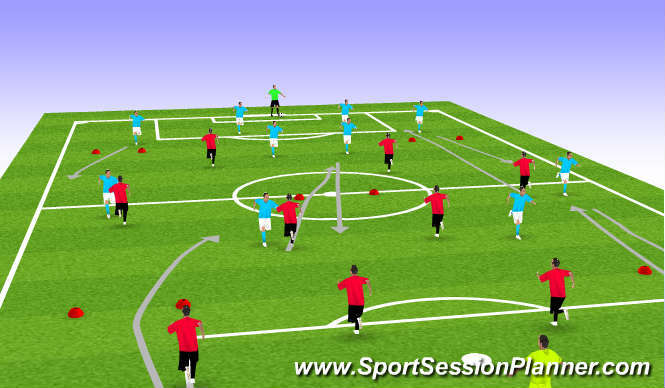 . .
Q+A session between plrs and coach -5mins . . .